One of the most pernicious conditions that arises as a consequence of cancer is a sort of wasting syndrome. More formally known as cachexia, it causes patients to lose body mass (including both muscle and fat) and to grow weak and fatigued. Whether or not a patient develops cachexia largely depends on the type of cancer he has. Those with pancreatic cancer, for instance, have an 80% chance of suffering from it, while those with breast cancer have a 40% chance. The syndrome takes such a physical toll on the patient that it is largely to blame for a fifth of all cancer deaths. Cachexia, therefore, remains one of the most heartbreaking and puzzling aspects of cancer. An article published last year in the journal Nature Reviews Cancer attempts to shed light on the molecular mechanisms underlying the condition. 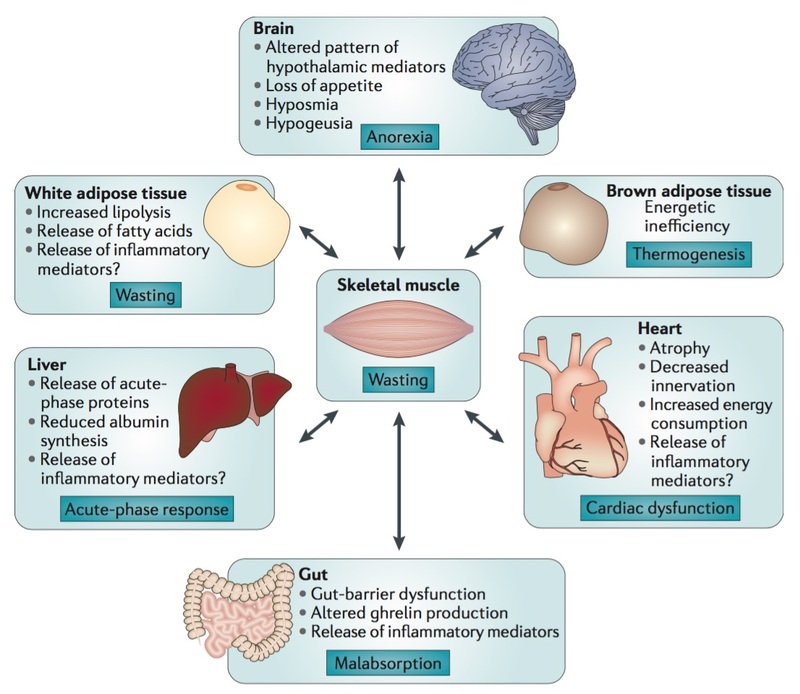 The authors believe that the existing evidence points to cachexia being a multi-organ syndrome that results from metabolic inefficiency, wasting of muscle and fat tissue, and systemic inflammation. An example of metabolic inefficiency is a futile cycle; that is, a vicious cycle that does nothing productive and wastes energy in the form of heat. Tumors tend to gobble up glucose, a valuable source of energy, and convert it to pyruvate, a waste product. The liver accepts the pyruvate and, in cachexic patients, converts it back to glucose (which uses up energy), before shipping it back to the tumor. Simultaneously, the energy-producing structures, called mitochondria, inside muscle cells start to malfunction. Worsening the problem for muscle cells is a total disruption of normal metabolism. Muscles begin exporting glutamine, an amino acid, into the bloodstream, after which it is imported by the tumor. This results in nitrogen starvation in the muscle cells. Furthermore, inflammatory molecules induced by the tumor tell muscle cells to destroy proteins and commit suicide. The ultimate result is muscle wasting. Similarly, metabolic changes inside fat tissue causes it to atrophy, as well. One such change is the diversion of mitochrondia from the production of energy “currency” (molecules called ATP) to the production of waste heat. Source: JM Argilés et al. Nat Rev Cancer 14 (11): 754-62. As if all of this weren’t bad enough, the side effects of chemotherapy and radiation therapy tend to aggravate cachexia. Can anything be done to stop cachexia? Perhaps, but it must be addressed before it becomes late-stage, which is untreatable. One potential therapy, described by Cosmos Magazine, involves using antibodies against a protein produced by cancer cells called Fn14. In mice, these antibodies effectively blocked cachexia. Human clinical trials may be on the way. The other good news is, though it certainly doesn’t feel like it, we are slowly winning the war on cancer. Source: Josep M. Argilés, Sílvia Busquets, Britta Stemmler and Francisco J. López-Soriano. “Cancer cachexia: understanding the molecular basis.” Nat Rev Cancer 14 (11):754-62. Published online: 9-Oct-2014. doi: 10.1038/nrc3829.